Mexico City-based artist Erick Meyenberg has created a major new artwork for the Jeppesen Terminal at Denver International Airport. 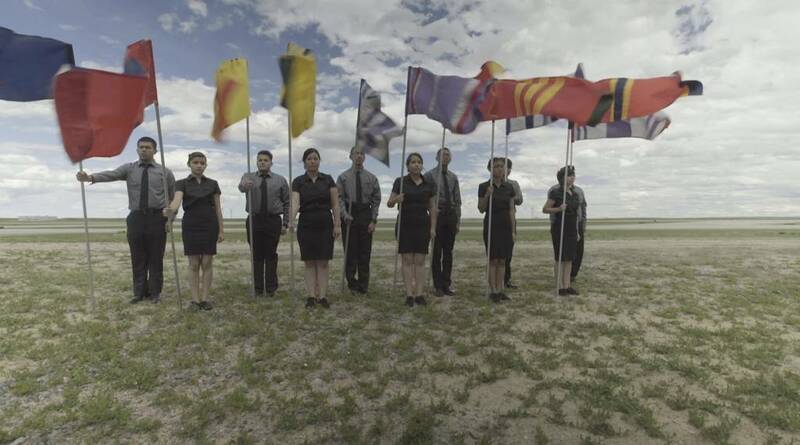 The artist collaborated with members of a high school drill team from nearby neighborhoods Montbello and Green Valley Ranch to create a live performance and a film and sculpture installation examining the fascinating past and present of the area surrounding the airport. Montbello and Green Valley Ranch have faced challenges resulting from demographic shifts in recent years. Montbello in particular developed a reputation for violence and poverty resulting in discrimination, which the community is working hard to overcome. Historically isolated from the rest of the city by the former Stapleton International Airport, the neighborhoods now have improved opportunities with their proximity to the newer Denver International Airport and new transportation links. The drill team members featured in this installation represent the future of their community, and of the city as a whole. In his film, the group embarks on a journey from the past, represented by the former Stapleton International Airport, through the present of their neighborhood, toward the future, the newer airport itself. Along the way, they perform extraordinary displays of skill, discovering strange buildings and stunning landscapes just minutes from their homes.